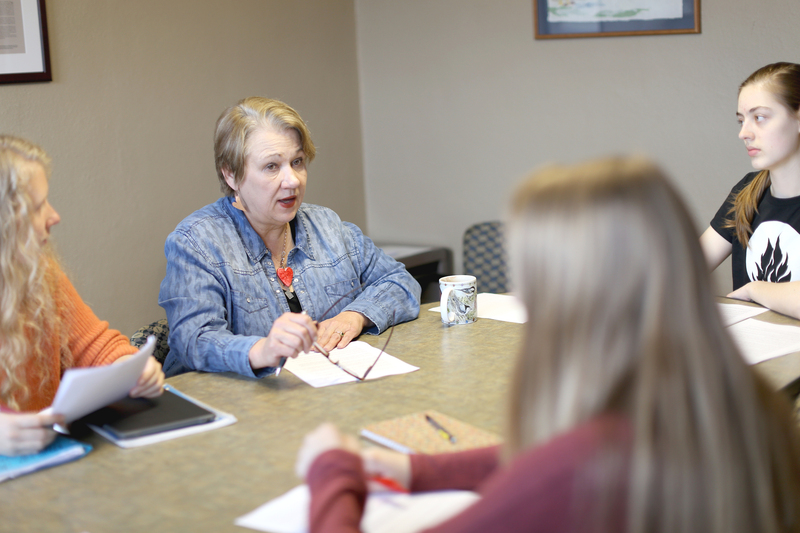 Cathy provides students with feedback during a feature writing class. Photo by Maddie Malat. After 21 years of teaching journalism at Concordia, Catherine McMullen won’t be moving very far away. Her new office in Academy will keeps its doors open as she continues to advise the staff of The Concordian, and work on writing projects of her own. McMullen has discovered, inspired and mentored dozens of budding careers during her time as a professor. She got her own start in journalism around her childhood dinner table. McMullen’s father was a long-time photographer for the Fargo Forum. McMullen got her own start at The Forum and wrote there for 13 years. It was during that time that she was approached with a teaching offer. At the time, Concordia’s journalism department consisted of the one class McMullen was teaching. She kept writing columns for The Forum during her first few years of teaching, until she was hired full-time at Concordia. McMullen’s purpose in teaching has stayed the same over the years, despite her change in teaching style. She teaches students how to get a job. McMullen’s hands-on approach comes with a straightforward tone that is famous among English students at Concordia. Her mix of journalism experience and service in the military produced a no-nonsense policy in the classroom. Many of McMullen’s former students have gone on to successful journalism careers all over the world. One of McMullen’s favorite parts of being a professor is seeing students develop as writers and people during their college years, she said. She keeps in touch with 30 to 40 former students, she said. Many of her former students still write and ask for advice, which flatters McMullen. McMullen’s colleague Scott Olsen asked former students and coworkers to email him their favorite memories of her classes, and share what McMullen means to them. A manilla envelope of several dozen emails now sits on her desk in her emptying office. Each email contains stories of former students who took her advice into the professional world. “Fake it if you’re uncomfortable; then do more research and ask more questions,” she said. McMullen was a year or two away from retirement when the early retirement plan was offered by the college, she said. Her husband teaches agriculture at NDSU and their schedules haven’t meshed in years, so she looks forward to him joining her in retirement come January. She has a few unfinished writing projects hanging over her head that she plans to get done, along with spending more time at the family cabin. McMullen believes in her students, and will be missed dearly. Now as a former student, I can’t help but feel sorry for the journalism students to come that will never be mentored by her.